The season is in full swing. Be sure to read these posts carefully as we do not meet again as a group until May. Topics include: GLOA Communication, Crew Communication, Arbiter Updates, Profile Pictures, Uniform and Patches, as well as Rules and Mechanics issues. Be sure to add add messaging@arbitersports.com and newsletter@galaxref.com to your email contact list so that Arbiter Sports emails and GLOA Newsletter emails do not go to your spam folder. The expectation is that the Umpire and Field Judge contact the Referee 48 hours in advance. The crew should discuss where they plan to meet and what they will wear. Officials are expected to arrive on site 30-45 minutes prior to the start time and should be on the field 20 minutes prior to the start of the game in order to address field issues, coaches certifications, coin toss, stick checks, FOGO conference, etc. Update your blocks, confirm profile information is correct and accept and decline games. Note that the system automatically declines games after 72 hours and blocks that day so that you cannot be assigned another game. Do not let the assignment expire: accept or decline promptly. Be sure that you have a profile picture in Arbiter. There are a number of officials who still do not have one uploaded. If you need GHSA and/or GLOA patches email swag@galaxref.com and let us know what address to mail them to. It is important, that we catch problems early in the season and address them. While these issues might not affect the game you and your crew are working, they can and often do cause problems for the next crew working at that site or with that team. It is imperative that officials check the goals during the pre-game. If there are holes in the net, these MUST be fixed. Inform the home teams head coach immediately if there is an issue with the goals. Though not required, having a few zip ties in your bag can expedite the repair process. You can quickly run back to your car and solve the problem. 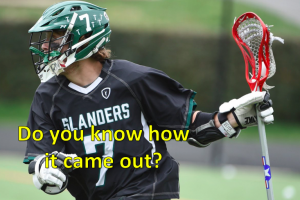 A standard NFHS lacrosse field is 110 yards by 531/3 to 60. This means that teams may use the football sideline (531/3) or the soccer sidelines (60) but that the endline should be midway through the football endzone. Free standing soccer goals must be moved out of the way. We only aware of one school that is considering the unified field layout. In this case, any soccer posts on the endline must be padded for the field to be legal. Player may wear eye black, but it must be one solid stroke with no words, numbers, logos or symbols. This is a 1 minute non-releasable illegal equipment penalty that can be easily avoided if officials are attentive during the pre-game. 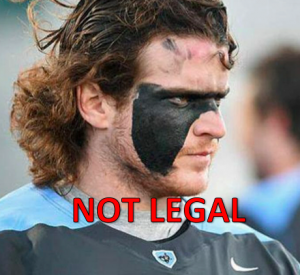 If you see any player with the full face paint, words, symbols etc….simply ask them to remove it before the game starts and be sure to inform the head coach. Catch this early in the season and it won’t be an issue. You MUST be 100% sure it didn’t come out as a result of play, (i.e. mouthpiece stuck on top of helmet, glove or sock). Team A not wearing mouthpiece: immediate whistle, turn ball over. 1.9.1 SITUATION B: A1, while driving to the goal, has no mouthpiece, the mouthpiece is hanging from his face mask or it is in his mouth but not worn properly. RULING: Stop play, technical violation, award ball to Team B unless the official knows the mouthpiece came out as a result of play. Think of it as offsides, if team A has the ball and is offsides you wouldn’t let them have more time to score, kill the play and award to B. If the team B is not wearing a mouthpiece, flag down and immediate whistle unless imminent scoring opportunity. B serves 30 second technical. If there is ANY chance it came out as a result of play in either situation (Team A or B not wearing), whistle play dead if no immediate scoring opportunity and have him put mouthpiece in or sub off, Team A keeps ball. If a goal is scored and officials realize the scoring player is not wearing a mouthpiece before the next faceoff, the goal counts, dead ball technical, award faceoff to opposing team. Rule 1.9.1 SITUATION E: A1 scores a goal. Before the next faceoff, it is noticed that (a) A1 is not wearing a legal uniform; (b) A1 is not wearing one or more mandatory pieces of protective equipment other than a mouthpiece; (c) has no mouthpiece. RULING: (c) Goal counts, technical violation, no time served. In all cases the game restarts with the ball awarded to Team B on its offensive half of the field at the Center. As always, be sure to practice preventative officiating. What we want is for players to be wearing mouthpieces properly and the best way for us to make that happen is to talk to the players. If you see a player whose mouthpiece is dangling from his helmet or doesn’t have it completely in and you do not know how it came out, simply ask them to put it in and continue to remind all players throughout the game. The 2018 US Lacrosse Mechanics Manual introduced the option of having of officials in a two-man game run left. That is to say the each official on a faceoff covers the goal to his left, rather than the goal to his right as we have always done. This allows for the faceoff official an easier release to his goal as he no longer has to loop around players during the faceoff scrum. The GLOA Training Committee has NOT adopted this mechanic and it was not taught during our January trainings. We are considering adopting this change next year, but wanted more time to roll it out. If two experienced officials working a two man game would like to try this mechanic out, they are encouraged to do so. However, do not use this mechanic if one of the officials is not comfortable doing so.